I've been avoiding using this book for a long time since, well, it was very good at the time and remains pretty good today, in spite of how much the science has moved on since 1993. However, while very dated/plain bad books are the best for yucks, it seems only fair to sometimes include those that were, you know, actually put together with a great deal of care and attention to detail. This was also by far and away my favourite dinosaur book as a kid (I turned six near the end of 1993), even if some of the more complicated anatomical terms sailed over my head at the time. Say hello once more to early '90s 'carnosaur' Spinosaurus, whom we have encountered before. 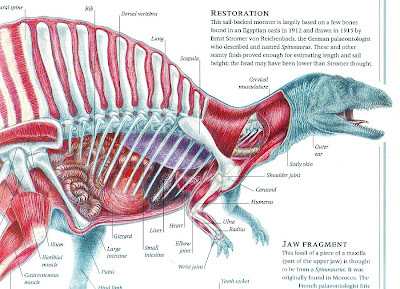 In fairness, however, David Lambert's text does note that this restoration is based on the work of Stromer, and that "the head may have been lower than Stromer thought" - other illustrations on the page show a more modern-looking, long and low snout. They all have the bizarrely four-fingered hands, though, likely based on Stromer's original monograph. I don't know why Stromer originally restored the animal with four fingers rather than three, but have a few ideas - if you happen to be a bit more informed then (as always) please do drop us a comment. 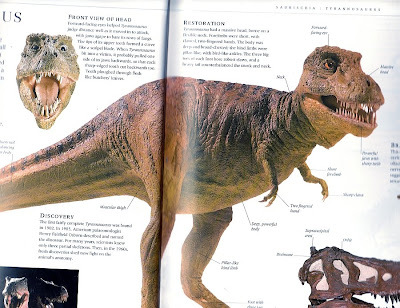 Poor old T. rex always seems to get a bit of a bum deal in these '90s books. While the model is mostly very good for the time, even as a kid the eyes struck me as being bizarrely huge. This, combined with the big ol' cute-puppy pupils, makes the big toothy one look all cuddly wuddly. Aww, bwess his piddly li'l twiggy arms. The same applies to the 'front view' head on the left, too. A look straight down the business end of Tyrannosaurus is intimidating enough when one is just looking at fossil bones (or, er, casts), but the oversized peepers make it look positively adorable. Obligatory 'tee hee! They thought dromaeosaurs were scaly in the '90s!' 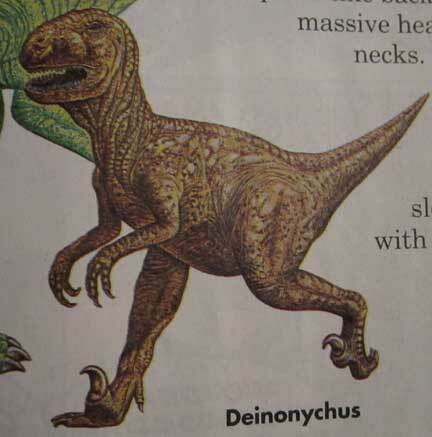 Deinonychus pic for you. 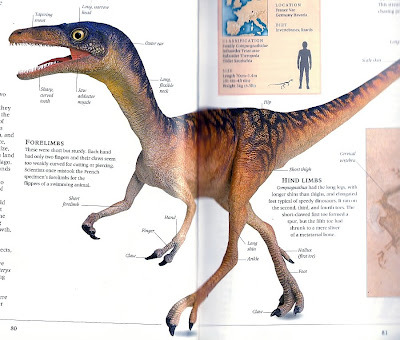 This model can actually still be viewed in London's Natural History Museum, where it's correctly placed in context with a lot of other outdated models, unlike certain other inaccurately naked Deinonychus. This image gains extra poignancy for having a 'scaly skin' label attached to it in typical Dorling Kindersley style. Of course, much like the miniature Crystal Palace-style Iguanodon figures that it sits next to in the Natural History Museum, this is still a beautifully sculpted work of art. 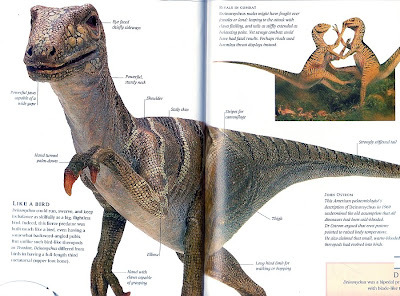 Speaking of outdated scaly deinonychosaurs, The Ultimate Dinosaur Book features a Troodon profile and, oh yes, that daft anthropomorphic freak from a David Icke slideshow is present and correct. This one's especially for Trish. Poor old Dale Russell - apparently he feels a bit embarrassed if one brings this up with him nowadays. We forgive you, Dale. This image and its accompanying text are funny for a couple of other reasons - firstly, because a lot of the labels seem somewhat superfluous (toe? Foot? Really? ), and secondly because the text literally describes Troodon as 'bird-like' before going on to say that Russell (sorry, sorry!) believed that this bird-like animal might have evolved into a humanoid creature. Oh dear. Time to move on to something a little less cringeworthy. 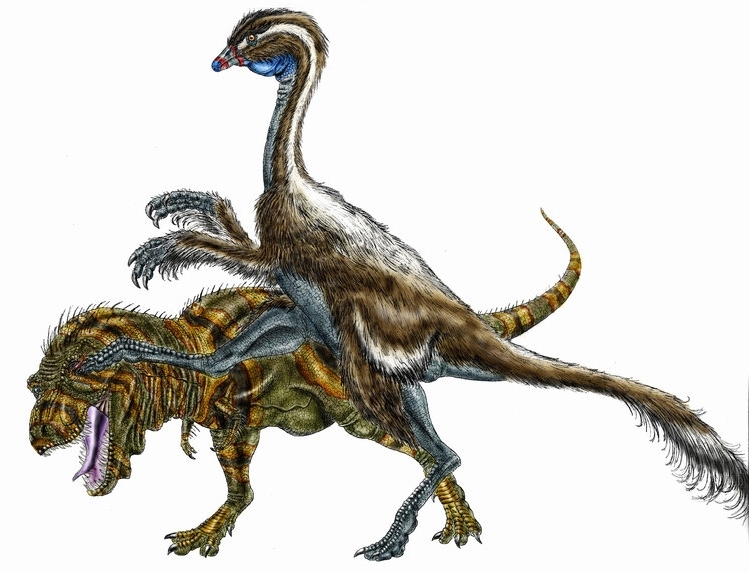 Yes, there are a number of things wrong with this picture of the therizinosaur Segnosaurus by modern standards (for one thing, it's another bald maniraptor), but for 1993 this is amazingly good. 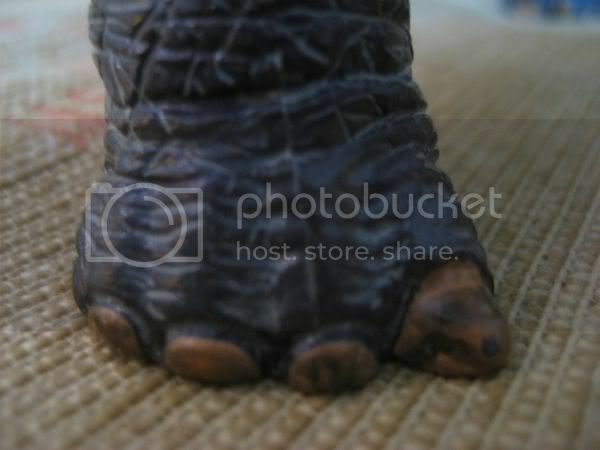 The foot with four well-developed toes - none of which are webbed - long neck with small head, and large hand claws are all present. Lambert even accurately speculates that the animal was most likely a strange, herbivorous theropod. 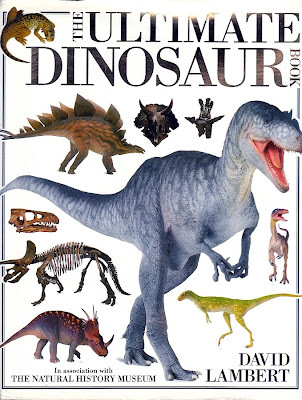 Given that therizinosaurs were so poorly known at the time, I think The Ultimate Dinosaur Book is remarkably prescient. Its only bizarre slip-up is in placing this guy at the end of the sauropodomorph profiles section. Huh. Two-fingered Compsognathus! That particular idea stuck around for quite a long time, with even the creatures in The Lost World: Jurassic Park having only two digits per hand. While, of course, the animal is now known to have the more usual three fingers, this model is notable for having the hands oritentated correctly. Whether by chance or not, I don't know, but it's still a plus point. Oh dear - it appears that I've been far too biased in favour of theropods again. Typical. Here, have a ceratopsian. 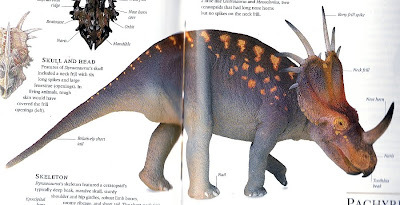 This, of course, is Styracosaurus - and it's a rather good one at that. I've included this to draw attention to something that was acceptable back in the day. but isn't anymore - namely, giving ceratopsians elephantine feet. As I pedantically pointed out just last week, this is actually now considered inaccurate - ceratopsians had quite distinct, separated digits on both their hands and feet, actually retaining quite primitive characteristics in this respect. Still, I will once again say that the model pictured above remains quite lovely - I am especially fond of the colours, which I believe have been ripped off in dinosaur toys (and quite right too). And now for an unceremonious end to this post. That's your lot for the time being! Although there's bound to be more in the future, unless DK's lawyers send me threatening e-mails. Given that these models were actually used across a range of DK books, I've hopefully brought back a few fond memories for you nonetheless. Here's a curiosity from my local, small town museum. East Grinstead (a town I live but a couple of miles away from) is located on a ridge in the Weald, a large area in the South East of England where Cretaceous formations have been exposed. A number of important dinosaur fossils have been unearthed here, including Mantell's "Iguanodon anglicus", the original Iguanodon type species (the type is now the Belgian Iguanodon bernissartensis) and Baryonyx walkeri. It's only natural for any local museum to trumpet dinosaur discoveries made in the vicinity (even if they were, in fact, made some miles away), which the museum have done by putting the cast of what they claim is an Iguanodon footprint on show. Of course, there's no way of telling if an Iguanodon species really did make the footprint, but given its age it's pretty safe to say that an iguanodont did. In any case, they also have a weird, weird Iguanodon statue on show that as far as I'm aware is completely unique. Check it out. One of my favourite features of this statue is the little man included for scale, wearing as he does a double-breasted jacket, waistcoat, flat cap and handsome moustache (although he could do with a dusting). Exactly how old it is I don't know, but judging by the attire of the tiny man and the dinosaur's bizarre anatomy it must date back at least 50 or 60 years. Perhaps the strangest part is the head, with its crazy-looking, bulging eyeballs and what appear to be tiny, fleshy ears. Strange stuff, but a lovely little bit of vintage art all the same. The photo below shows the statue in the context of the museum's display, with the footprint cast alongside. Also worthy of note is that "Iggy" (yeah, really) is the museum's mascot. If you ever visit the town for whatever reason (which is pretty unlikely, granted, unless you live nearby or are a...shudder...Scientologist) entry to the museum is free, but do check the opening hours! Dinosaur collectibles (both toys and more expensive, breakable, resin creations) have made huge strides forward in recent years, especially in terms of anatomical accuracy. While it's easy to dismiss the interests of us man- (and woman-) children, actual kids who know their dinosaurs are also more likely to plump for models that look 'real' just because, hey, a convincing-looking dinosaur is just that much cooler than one that looks like a goofy 1970s (or even 1990s) throwback. Obviously, certain concessions still need to be made, particularly for the toy market - for example, I don't think anyone's blaming manufacturers for truncating awkward sauropod tails. Nevertheless, there are still persistent goofs - a lot of them stemming from palaeoart memes or good old pop culture inertia, but some of them from plain laziness - that could easily be avoided. With that in mind, I've drawn up this here list - the (not quite) Ten Dino Toy Commandments, if you will. As a bonus, these rules handily apply to other forms of palaeoart too! Hooray. Above: the Safari 'Great Dinos' Velociraptor is well-proportioned, and the head is excellently sculpted, but it's probably a little chilly owing to its lack of a warm feathery coat. Promotional pic from Safari's website. Self-explanatory, really, and still an area where there's masses of room for improvement on all sides. It's space-year 2011 now - we've got to the stage where dystopian visions of shiny advertising screens in our public transport systems have become a nightmarish reality, but more positively we have also entered a new 'golden age' of discovery in palaeontology. The Mesozoic world becomes more fascinating, more outrageous, more colourful, and more vivid with each passing year. And yet still, damnit, manufacturers are inexplicably churning out scaly maniraptors like it's 1993. What's more, anyone who isn't an idiot will agree that feathered maniraptors invariably look more attractive and far cooler than their inaccurate, scaly counterparts - when they're done properly, anyway. There's no need to worry about people being turned off by a feathered Velociraptor. Another mistake that just won't go away, and typically the result of people copying out-of-date palaeoart, or simply making assumptions based (presumably) on human or mammalian anatomy. While it's very easy for us, as freaky primates, to rotate our forearm so that the palm faces the ground, in theropod dinosaurs this was actually a physical impossibility; the forearm would have been 'locked' with the palms facing inward. This is still true of modern birds. Theropods with rabbit/zombie hands aren't only wrong, they often look completely ridiculous. Above: the Schleich Replica-Saurus Apatosaurus, suffering from a bad case of 'elephant's foot'. Photo by Stefan Schröder, from the Dinosaur Toy Blog. This one is presented as a simple statement in the hope that it will forever hang around in the minds of dino-sculptors, manifesting as a sinister whisper in their ears whenever they think about giving a sauropod elephant feet, or elephant nails, or elephant skin, or an elephant torso etc. etc. Once again: sauropods were NOT elephants. The only similarity is large size and in that regard even medium-sized sauropods make the largest elephant alive today - Loxodonta africana - look a little bit small. In fact, sauropods were radically different to elephants, and that includes their feet - especially their forefeet (or hands), which were a concave collonade of digits with only one claw. So no more sauropods with five elephantine nails on their round hands, please. See 3. Ceratopsians actually had differentiated digits on their hands and feet - they were not united in a single paw. Too often dinosaur toys continue to be rendered in the same earthy greens, browns and greys, a palette that can become quite monotonous over time. Although the problem of sauropods inevitably being painted in 'elephant grey' is slowly disappearing, manufacturers often show a sad lack of imagination when it comes to ceratopsian frills. Since they were almost certainly involved in display, there's a great opportunity there for showy, dazzling patterns and colours that's often missed. Collecta are starting to cotton on to this (their Torosaurus stands out a mile), and I'm hoping that other companies will follow suit. Above: the Papo "Ankylosaurus", lovingly and admirably detailed but, alas, totally tubular. Dude. Ankylosaurs are quite popular subjects for dinosaur toys, and yet they are very rarely got right. Perhaps the best one in the 'serious' toy market is the Favorite "Ankylosaurus", which is actually a Euoplocephalus. A very good Euoplocephalus, as it happens. The most common mistake made when sculpting ankylosaurs is giving them a rather 'tubular' body, when in fact the very wide hips meant that it flared out crazily over the rear end. This rule can also be applied to the neck of one sauropod in particuar - Apatosaurus, with its barmy neck o' fatness. Very few Apatosaurus models are anatomically correct in this respect, and when they are even palaeontologists find them weird to look at. When dinosaurs are strange, don't hold back on the strangeness! This applies especially to 'museum' or 'scale replica' lines. Toys they may be, but anything with that tag - for example the Schliech Replica-Saurus, Bullyland Museum Line and Carnegie collections - deserves serious scrutiny, as they profess an educational remit. Granted, when there is a lot of reference material available for an animal and the sculptor knows what they're doing, this might not be necessary. However, most palaeontologists will be happy to offer their expertise in pursuit of a well-crafted figure, and they'll usually do it for free. (I nearly said 'always', but...you never know.) This entry goes out in particular to Papo, who make some of the most finely sculpted and painted dinosaurs out there - that also happen to be riddled with frustrating inaccuracies most of the time. If they got hold of an expert or two their dinosaur line could be a world-beater. Seriously, people. Especially the T. rex. Bored already. I can see the obvious incentive when it comes to sales, but come on! More imagination, please. 10. That's it. If you can think of any more, or disagree with some of mine, or think that this blog has gone way downhill recently with all this toy-related stuff, then comment! Heaps of geek points available to the person who knows which magazine I've ripped off (although theirs was a rip-off too). Submitted this to Paula Deen Riding Things today. Deen is an American celebrity chef of note. Apparently, she used to be an agoraphobe. Now she's an internet meme. That's a transition that should give hope to us all. 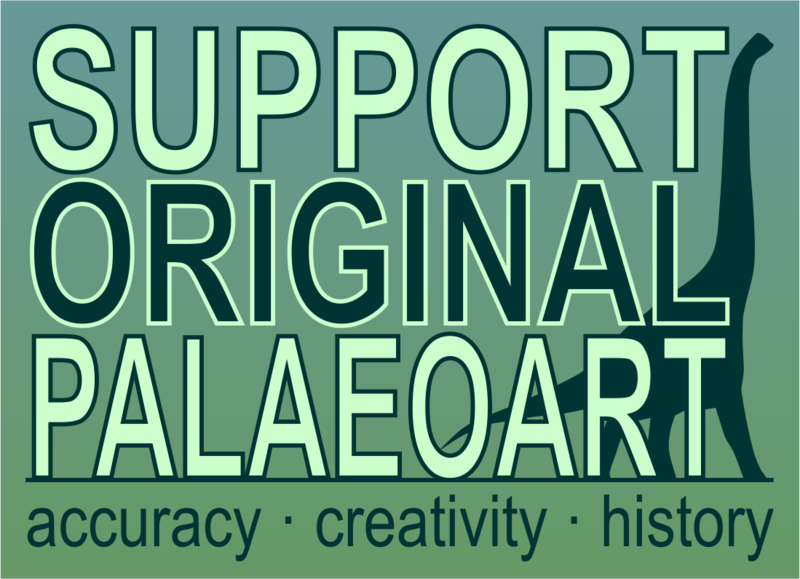 Our close comrades at the paleoart blog ART Evolved have announced that the next gallery, coming in February 2012, is dedicated to feathered dinosaurs. For the first time since the pink dinosaur breast cancer drive in October of 2010, I know for sure that I'll actually have work to submit. I've begun work on a series of illustrations dedicated to the various intriguing critters who muck around at the base of the bird family tree, thwarting anyone who needs perfect clarity in the delineation between "bird" and "dinosaur." This is all in preparation for next August, when I will be exhibiting my illustrations at the Bloomington, Indiana children's museum Wonderlab. I'll also be doing a little educational presentation on dinosaurs and birds, and building on my current studies, every child will get to go home with their own "feather fossil," which I'll help them print. It's going to be a lot of fun, and I'm grateful to Wonderlab for inviting me to do this. As a sneak peak... look into the eye of Buitreraptor, an unenlagiine dromaeosaur from Argentina whose greatly elongated snout made it irresistible to me when jotting down illustration subjects. I'll have more information on my Wonderlab presentation closer to the date; in the meantime, get your favorite art utensil and start on some feathered dinos of your own. Head to ART Evolved for more information, and to learn about their retooled gallery schedule. 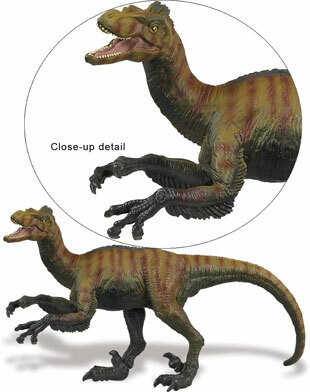 More Deinocheirus goodness for you (and also toy news, ahem). The good people at Collecta, who make respectable animal figurines for us discerning collector-folk (or toys, if you prefer), have unveiled their new sculpt of Deinocheirus mirificus - hitting the shelves in 2012. D. mirificus, as any fule kno, is only known from a single pair of partially complete giant arms. 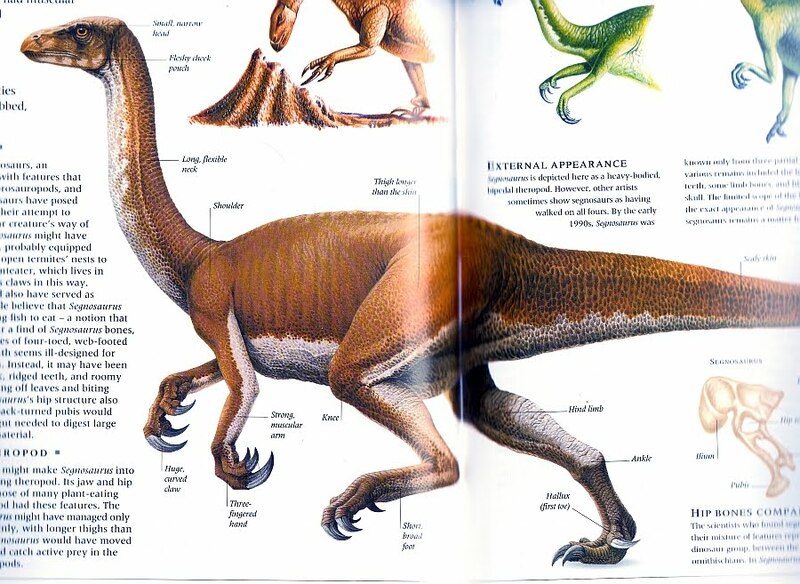 Hypotheses as to what the whole animal looked like have varied over the years, but the most plausible idea currently appears to be that it was a giant ornithomimosaur, although a primitive one. 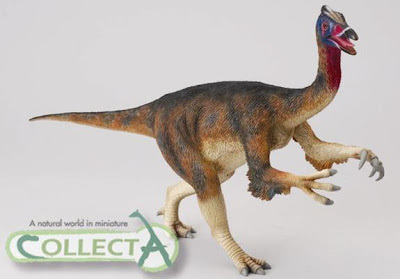 Collecta have run with this idea, and produced what appears to be one of the best ornithomimosaur toys to date. Not only is it bipedal (rather than leaning on its tail), it has a lovely covering of 'protofeathers' and a suitably attractive colour scheme - I particularly like the head. 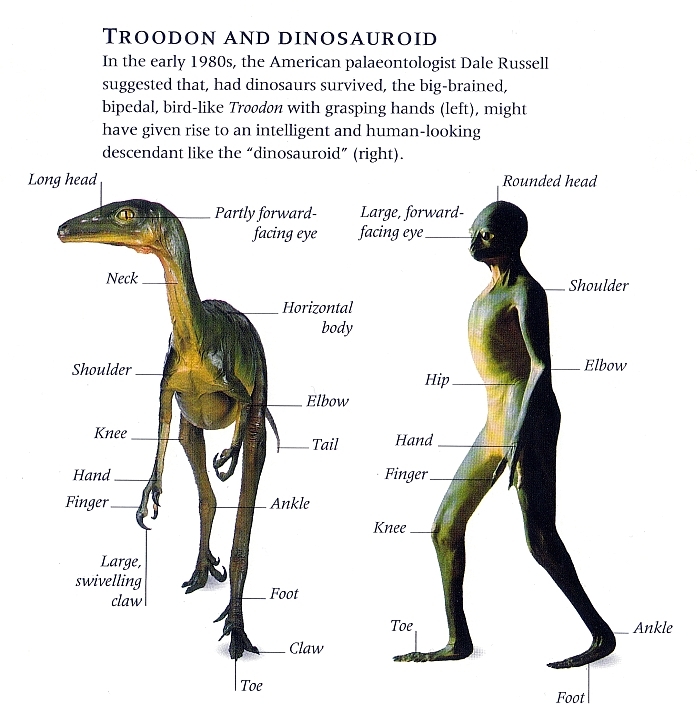 Being a primitive ornithomimosaur, the animal still has a first toe (or hallux) on each foot. Perhaps most importantly, this figure marks the zenith of what has been a stunning turn-around by Collecta. Until quite recently they were widely derided as being producers of crudely sculpted, anatomically incorrect, child-friendly dreck, but now they're really upping their game, just as other manufacturers appear to be losing it. They're definitely one to watch for dino figures in 2012, especially if their other recently-announced (and somewhat less hypothetical) theropods can match this one. 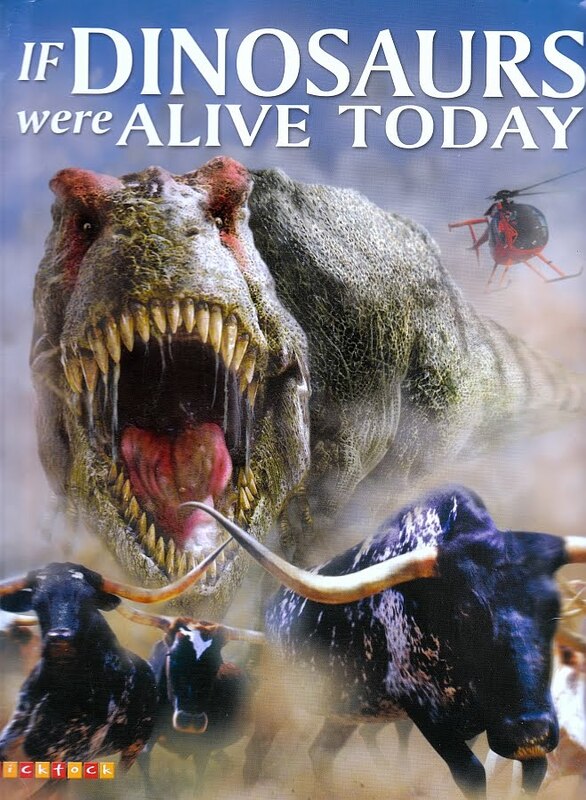 Last week, freqent commenter Hadiaz alerted me to the existence of the book If Dinosaurs Were Alive Today, describing it as the "last straw" that made him cease taking Dougal Dixon seriously. Trish then said that she had purchased a copy of said book from Amazon for a penny. Already curious, my interest was stoked further when I caught a glimpse of the dreadful front cover (see below). It's in my hands now, and oh boy - it's what you might dub 'a doozy'. Especially if you love terrible Photoshopping and inaccurate, cheapo-looking CG dinosaurs. Unfortunately this coffee table volume is somewhat too large for my scanner, but I've done my best to try and cram as much of each bizarre spread in as possible. 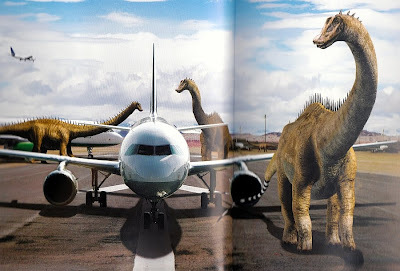 In any case, here we have a group of skeleton-faced Diplodocus hallorum (="Seismosaurus") moseying rather unconvincingly around an airport in the middle of nowhere. Speaks for itself, surely? If you thought the animals in the above picture looked reasonable (except for the feet and heads), then worry not - there is some properly embarrassing stuff in here. ...LIOPLEURODON! ITS HEAD WAS BIGGER THAN AN ORCA! ITS BODY WAS BIGGER THAN WEMBLEY STADIUM! 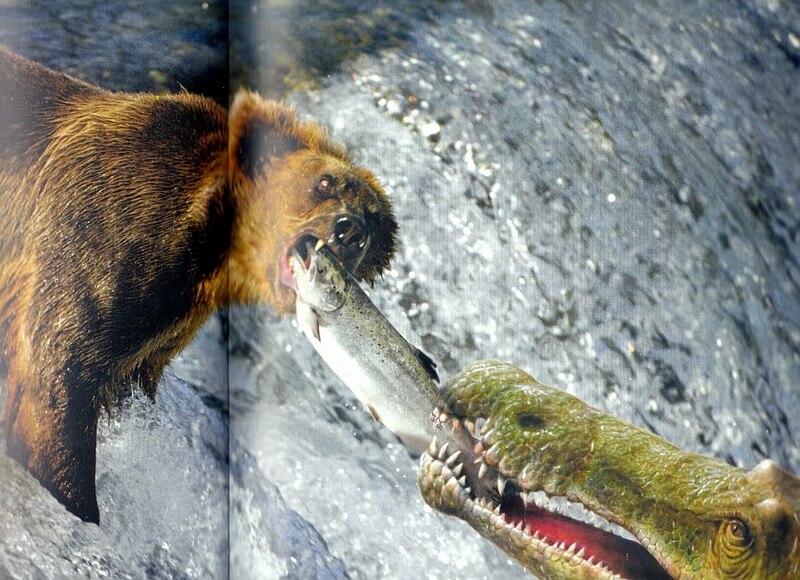 IT WAS TEH BIGGEST EVAR PREDATORY ANIMAL OF ALL TIME!!!1! Yes, it really is Liopleurodon, and yes, the book really does claim that it reached some 24 metres long and weighed 90 tonnes, and so would be snacking on killer whales if alive today. Never mind the fact that there's no way a 90-tonne animal would ever get that close to the shore without beaching itself - just drink in the sheer insanity of that image. And then prepare to guzzle down the utter madness of the next one. 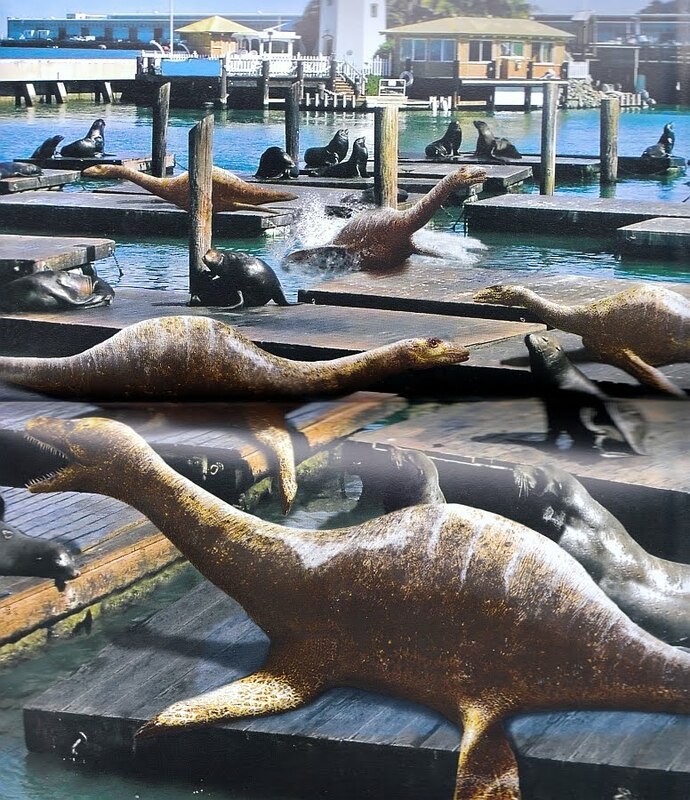 That'll be Cryptoclidus sunning itself alongside some sea lions. Because, apparently, they are quite alike (but of course!). 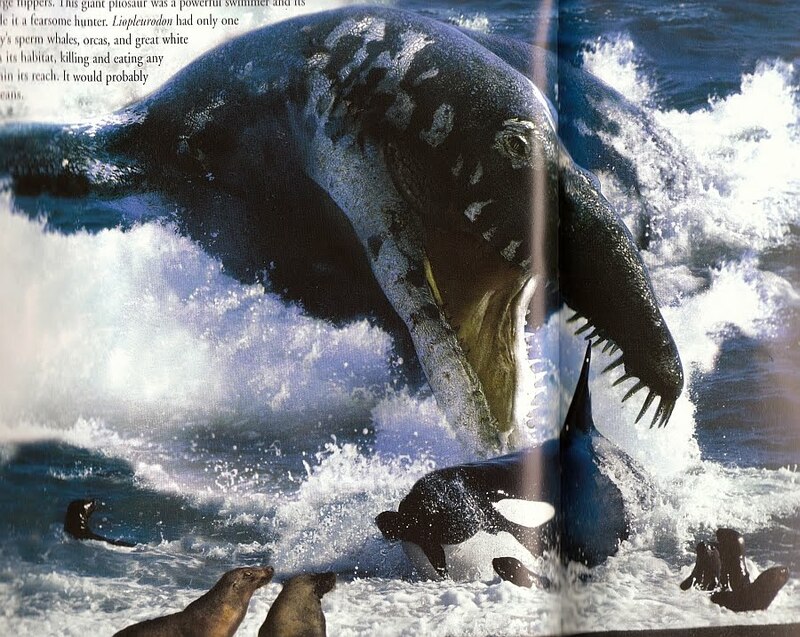 Enough plesiosaurs, though - I worry for the sanity of certain people who might be reading this. Back to the dinosaurs it is. And you know what would be cool? 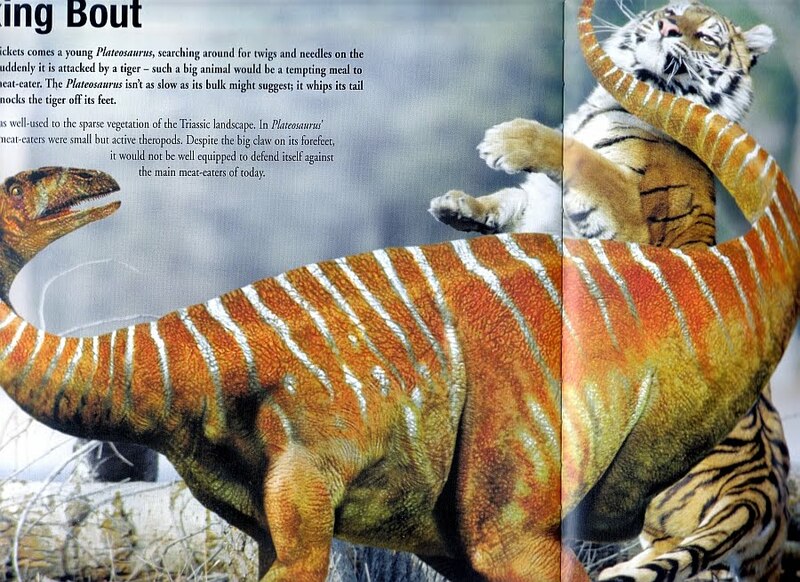 If a dinosaur fought a tiger. Cheers then. Yeah, take that, kitty! That's a Plateosaurus tail-slap in the face for you, my friend. Nevertheless, Dixon informs us that "it would not be well equipped to defend itself against the main[?] meat-eaters of today". 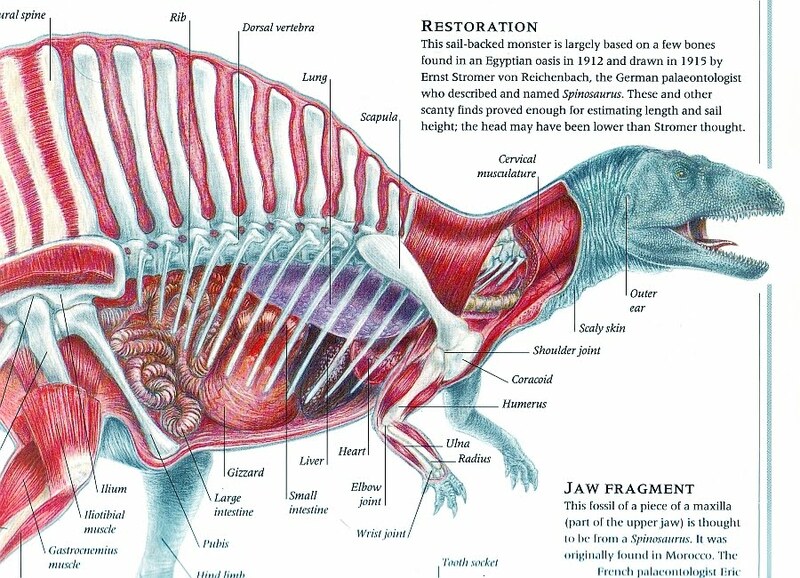 Unfortunately, we are not shown the bloody aftermath in which the tiger is enjoying a tasty slab of sauropodomorph. We are shown a pride of lions tucking into a Ceratosaurus, but I just couldn't bring myself to scan that madness. Have a perfectly sensible image of three Archaeopteryx mobbing a bald eagle instead. "As the earliest known bird," Dixon tells us, "Archaeopteryx shows features of both modern birds and its ancestors, reptiles - it appears to attack its descendant so that it can eat its ancestor!" Hnnnngggghh. Ouch. To be fair, Dixon does unequivocally state elsewhere in the book that birds are dinosaurs, but that is one awkwardly-worded sentence. In what seems to be his typical style, Dixon mixes a lot of solid facts with some real oddities (oh, and 'macronarian' is spelled "macronian" - whoops). The art, though, is just unbelievable. It's bad, and yet at the same time it's so batshit mental that it transcends its own shoddiness. In short, it's so bad it's good. This is definitely worth buying for a penny from Amazon. And with that, I'll leave you with a Baryonyx playing tug-of-war with a grizzly bear. It's been a very eventful month since I last gathered up a heapin' passel of links from around the dinosaur blogosphere, so why am I wasting time with a belabored introduction? Let's get to it. The Society of Vertebrate Paleontology meeting for 2011, held in Las Vegas, has come and gone. This year's conference has seen the most extensive online coverage yet. The hashtag #SVP2011 was handy, if not exactly widely used by attendees. That will likely change as more rowdy youngsters come up through the ranks. Plenty of blogs provided coverage, however. Brian Switek was there, natch. He provides great posts on the presentations at Dinosaur Tracking under the SVP Dispatches tag. 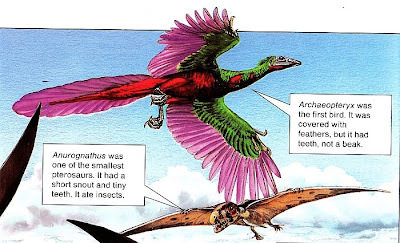 H2VP has begun a series on the conference with a post about blog co-author Mike Habib's a new paper he collaborated on, dealing with friggin' huge birds, "Flight Performance of Giant Pseudodontorn Birds." It's published by PLoS One. Jenn Hall hands out a bunch of SVP-themed awards at Clever Girl, including "Best Dinosaur Bosses" to Bob Walters and Tess Kissinger. Mark Wildman has been writing about his experiences at SVP at Saurian, starting with his highlights, continuing with a post about sauropod presentations. David Tana's blog Superoceras features three posts about the conference, with a prologue, Day 1 round up, and another about the networking opportunities for students at SVP. David promises more to come, so stay tuned. Susan Drymala provides a roundup of archosauromorph presentations at Crurotarsi. Heinrich Mallison was able to post a dispatch on the conference's third day, as well as a short summary afterwards. He's also posted about his own talk at SVP, "Fast moving dinosaurs: why our basic tenet is wrong." It's gotten a bit of press, as well; from Nature, which was mirrored by SciAm and another piece at the Atlantic. At PhD in the Land of Enchantment, Mel provides another take on the conference, discussing the good and bad points. Anyone who's been to Vegas and not particularly enjoyed it may know where this is going. Jazinator was pleasantly surprised by the overall friendly environment at SVP, having been warned about a higher D-bag population than is healthy. For a post that matches its subject for massiveness, pull up a a chair and get comfy for Nima Sassimi's piece at The Paleo King about the hoary subject of what taxa can truly be considered the largest dinosaurs of all time. You can also check in with the SVP at Twitter. Speaking of which, I curate a list of dinosaur tweeters, which you can check out whether you have a Twitter account or not. As always, feel free to suggest folks I'm missing. There's no way anyone who reads this blog hasn't heard about this yet. But just in case...here's a very interesting interview with Peter Larson who describes this find as - without undue hyperbole - "one of the most exciting dinosaur discoveries that's ever been made". While you're at it, be sure to check out some of the other recently-uploaded videos from the Black Hills Insititute, featuring (among others) Bob Bakker and "Dino-Cowboy" (cringe) Clayton Phipps. Update: Brian Switek (for it is he) has authored a blog post calling into question some of the more senstational claims made by Larson and the others. Go forth and read! David Krentz at Comic-con, discussing Dinosaur Revolution. Photo by Peter Csanadi, via Flickr. I'm hosting a FREE webinar on THIS Thursday November 10 at 10 AM Pacific time on sculpting dinosaurs with the artist friendly software ZBrush. This will be a preview of a longer class set for the 18th of November where I'll cover the creation of a digital dinosaur from start to finish. This is the same program I created over 70 dinosaurs for Dinosaur Revolution. Its basically sculpting digital clay! If you've ever been curious about new methods of digital sculpting and how it can be applied to paleoart or research for free this is the perfect opportunity. You can register there. The preview will be live and will be about 1 1/2 hour long. This is a really cool opportunity! He is a true master. Check out his Antediluvia Collection at his website, and be sure to browse his Shapeways store, where you can buy resin models of his work. 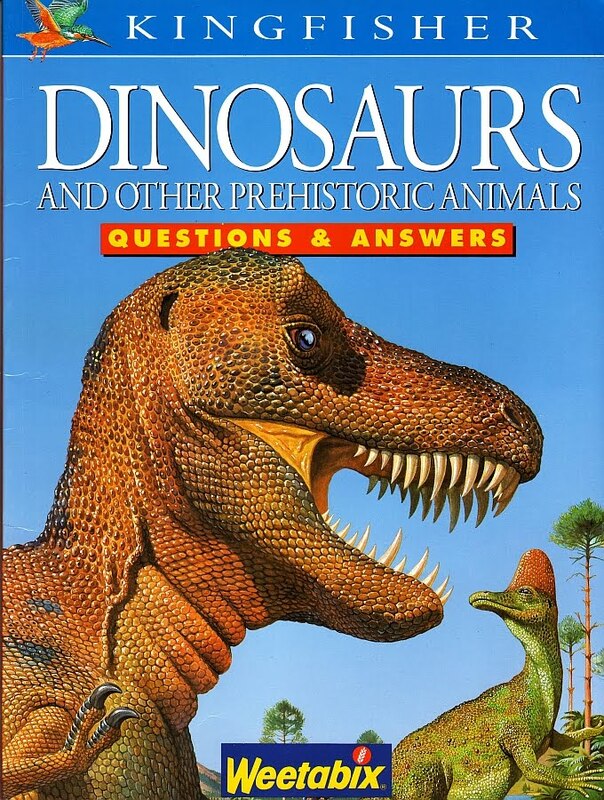 I was drawn to this book (full title: Dinosaurs and Other Prehistoric Animals: Questions & Answers) on eBay thanks to its Bernard Robinson cover. As you'll recall, Robinson's work is notable for being simultaneously very outdated and very gorgeous; while his lizardy, man-in-suit theropods (like the Tyrannosaurus below) wouldn't pass muster today, they remain a marvellous accomplishment artistically. The pebbly skin textures look almost touchably real, the glassy eyes veritably alive. 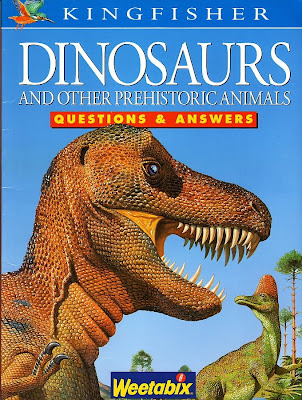 Unfortunately, the cover is the only one of Robinson's illustrations to feature in this book - probably because, by the '90s, they were already looking historic and scientifically obsolete. First appearing in 1993 under a different title, the book was first published in this form in 1995, and then again in 1998 as part of a Weetabix promotion (hence the logo). Rather boringly, the illustrations that are inside are, for the most part, competent and accurate enough for the '90s (with the usual quotient of John Sibbick rip-offs). As such, there aren't too many that really stand out, so forgive me if this is a short entry. By way of example, the above Troodon is actually pretty good - you know, for the early '90s. Of course it's buck naked and bunny-handed - as all contemporary maniraptors were - but it's clear that the illustrator (one Steve Kirk) knew what he was doing. This is hardly surprising, as the venerable Dougal Dixon was behind the text, and I doubt he'd want his name stuck to any old muck. Another pleasing aspect of this Troodon is that it doesn't resemble anything sculpted by Dale Russell (look ma, round pupils!) 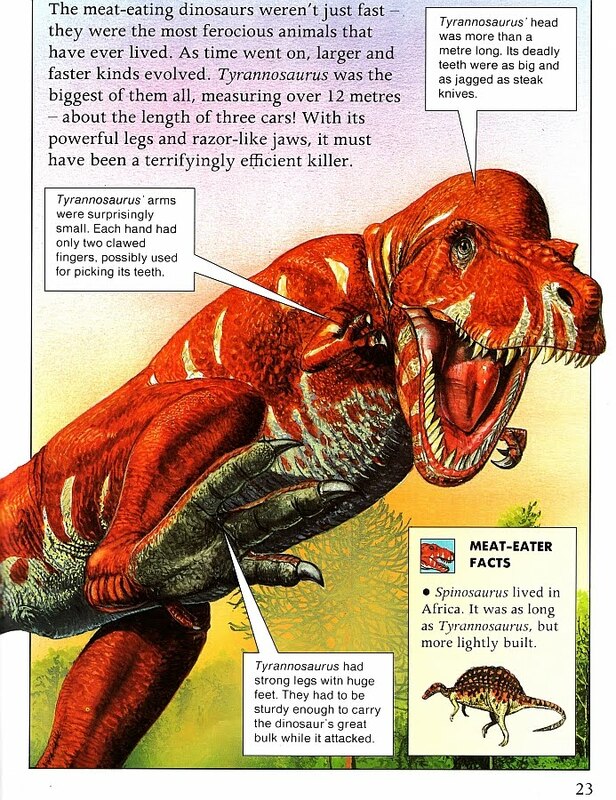 and there's no mention of the bloody 'Dinosauroid' travesty, which as Trish has noted (here, for example) was a near-obligatory inclusion in '80s and '90s dinosaur books for no good reason whatsoever. Here's one that's good for a giggle. It was revealed at this year's SVP that Archaeopteryx was, in fact, rather black, thus ending the long reign of the 'sparkleraptors'. The above Archaeopteryx isn't the worst ever anatomically, but wow - those colours. Those searing, horrifically clashing colours. It reminds me of Quentin Blake's illustrations of the Roly-Poly Bird. Interesting to note, Archaeopteryx is included on a spread alongside a gathering of different pterosaurs, but none of its dinosaurian relatives - an example of the strange old trend of keeping Archaeopteryx apart from other dinosaurs. Finally, here's one that I've included because it's the exception that proves the rule (and because peculiar illustrations are a lot more fun to look at than blandly good-enough ones). Once again, poor old Tyrannosaurus is subjected to sub-par treatment, in this case adopting a very peculiar 'BOO!' pose while its cranium and mandible go in different directions. Dixon's text takes an odd turn here too, speculating that the forelimbs of Tyrannosaurus were "possibly used for picking its teeth". 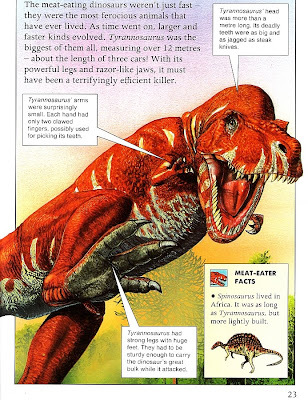 This in spite of the fact that, as every kid who's read a dinosaur book knows, T. rex had 'arms so short that they couldn't even reach its mouth'. What the hell, Dougal? At least the long-snouted Spinosaurus here is impressively forward-thinking. Still, all in all I need to look a lot harder to find antiquated, interesting and/or amusing dinosaur books. Preferrably not from the '90s, and preferrably cheap. We'll see where my efforts get me! Back in October, David featured a wonderful illustration of Gallimimus by Paul Heaston in his 46th Mesozoic Miscellany. 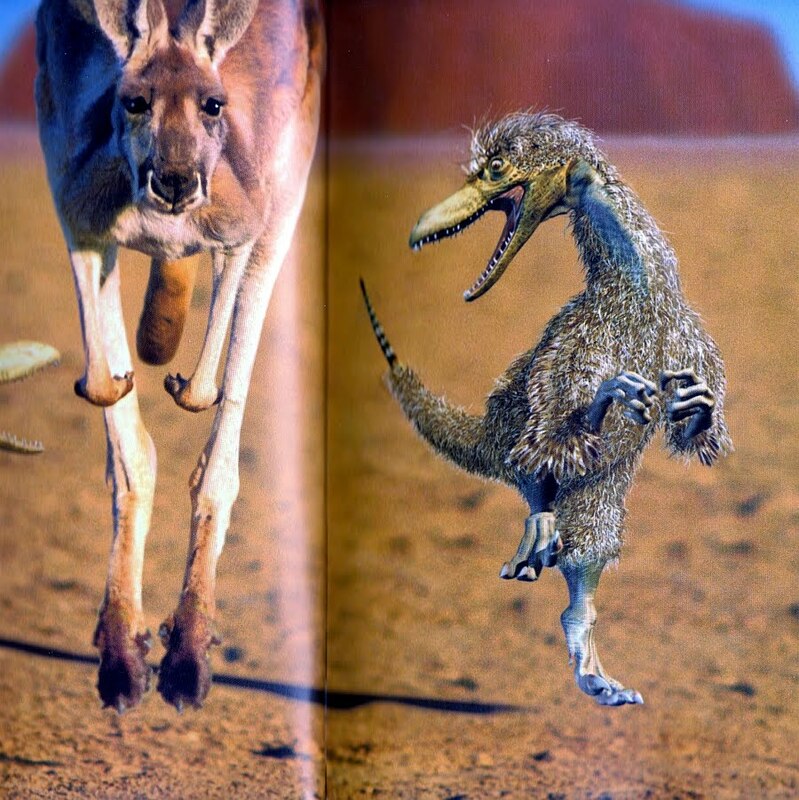 Paul remarked that "ornithomimids are being ignored in the dino-media and paleoart" - and David agreed, adding that he'd like to see "an ornithomimid triumphant over a tyrannosaur". I then jokingly remarked that perhaps an artist could draw "Deinocheirus jabbing a tyrannosaur in the eye", adding that regular deviantArtist 'Durbed' might oblige, as he is known for wince-inducing and occasionally slightly unlikely scenes in which prey items exact bloody revenge on popular giant theropods (like Daspletosaurus). 'Durbed' (also known as 'Arioch' - I nearly asked him what his real name was, but quite liked the mystique), who is no slouch, duly obliged. Some time ago. So, here it is, with apologies for the delay on my part! (I've cropped out a little white space here - be sure to check out the original on deviantArt, where of course it can also be viewed hi-res). In addition, the ever-reliable Niroot produced a wonderful piece in which a gaggle of Ornithomimus are mobbing a threatening Albertosaurus. Well worth a look. 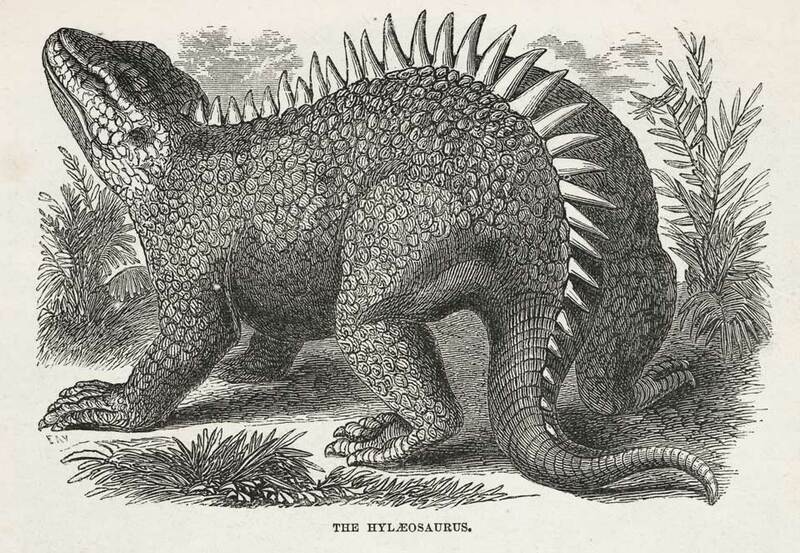 Of the three founding members of Sir Richard Owen's dinosauria in 1842, Hylaeosaurus is easily the most obscure. 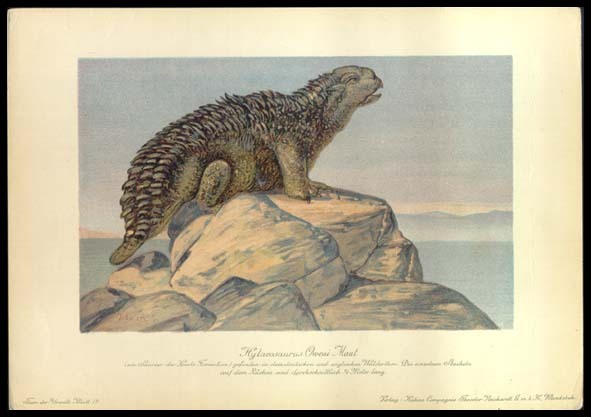 Iguanodon is a classic, giving a spiky thumbs-up in dinosaur illustrations for well over a century. Megalosaurus is a fairly well-known wastebasket taxon, and was selected as the taxon of Earl Sinclair, blue-collar patriarch of the sitcom Dinosaurs. Hylaeosaurus? Despite being represented at the Crystal Palace exhibition, it barely rates a mention in most dinosaur books. Hylaeosaurus, now known to be a primitive nodosaur of the Early Cretaceous, is probably best known from two artistic representations: The Benjamin Waterhouse Hawkins sculpture and the set of German Tiere der Urwelt trading cards from about a century ago. Benjamin Waterhouse Hawkins' illustration of Hylaeosaurus for his Crystal Palace Exhibition sculpture. 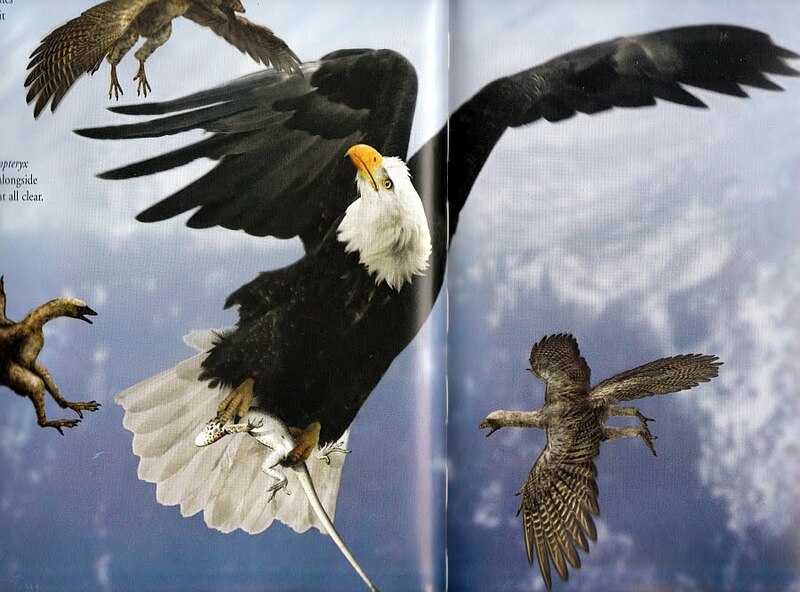 From Paper Dinosaurs. 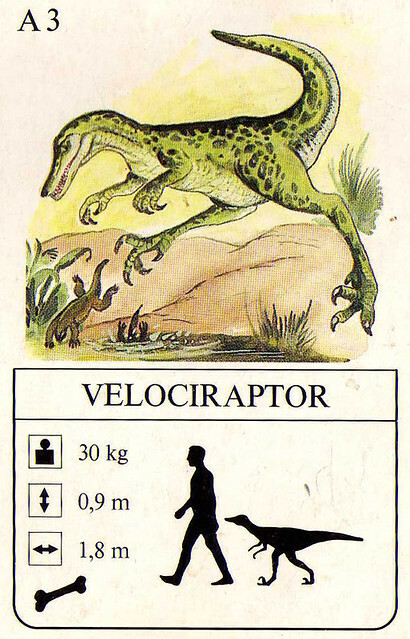 F. John's Hylaeosaurus from the Tiere der Urwelt cards, obtained from Copyright Expired. This latter illustration, like the other illustrations in the card set by F. John and Heinrich Harder, is based on an earlier one, which I've traced back to a French publication from about forty years prior. Hylaeosaurus from Meunier's L'Animaux d'Autrefois (1869). In 1869, french science writer Victor Meunier wrote an overview of extinct animals called L'Animaux d'Autrefois (Animals of the Past). Three years later, William Henry Davenport Adams published a translation of Meunier's text, expanded and revised for his English audience, called Life in the Primeval World. Adams writes that he believes it to be the first paleontology book published in English for a lay audience. I think he may well be correct in this. Samuel G. Goodrich published his Illustrated Natural History of the Animal Kingdom in 1859, but Adams focused exclusively on extinct creatures. I presume that these woodcuts were done by Meunier himself, as neither the Meunier nor the Adams volume credits anyone else. Some are clearly based on earier works, such as this Megalosaurus, which owes a clear debt to Owen and Hawkins. Meunier's Iguanodon is based on Mantell's and Owen's ideas of a quadrupedal, spike-nosed beast, but is one of the more fearsome of the early depictions, likely influenced by Louis Figuier's version which predated it by two years. Of course, those flying dragons who so excited the minds of writers made an appearance, too, with Pterodactylus striking a pose and an awkwardly rendered Rhamphorynchus. The watery world got some love too, with the rarely illustrated thallatosuchian Teleosaurus and the de rigeur Plesiosaurus, rearing swan-like upon the waves. If these can be sourced to someone other than Meunier, please enlighten me, as I'd love to be able to dig even deeper. As always, you can find these in the Flickr Vintage Dinosaur Art group, along with hordes of other dinosaur images. For your convenience, you can even add it as a feed in your reader of choice. Easy peasy mac n' cheesy! There can be only one. The 'croco-raptor' certainly had its fans, but our champion ended up attracting over twice as many votes. This may have had something to do with Traumador pointing out that, hey, the croco-raptor wasn't actually that bad for the time, and blowing raspberries at outdated/misguided art is plain mean (which I concede). However, the whole contest is meant to be in the best spirit of fun; of course it's important to realise the context this art was produced in, and far too easy to sneer with the benefit of hindsight ("fun, too"). That said, some of the art was just dreadful, and perhaps our valiant winner fits into that category. Well, that's the end of that. If nothing else, this tournament has surely taught us an important lesson - namely, that a lot can change in 20 years. 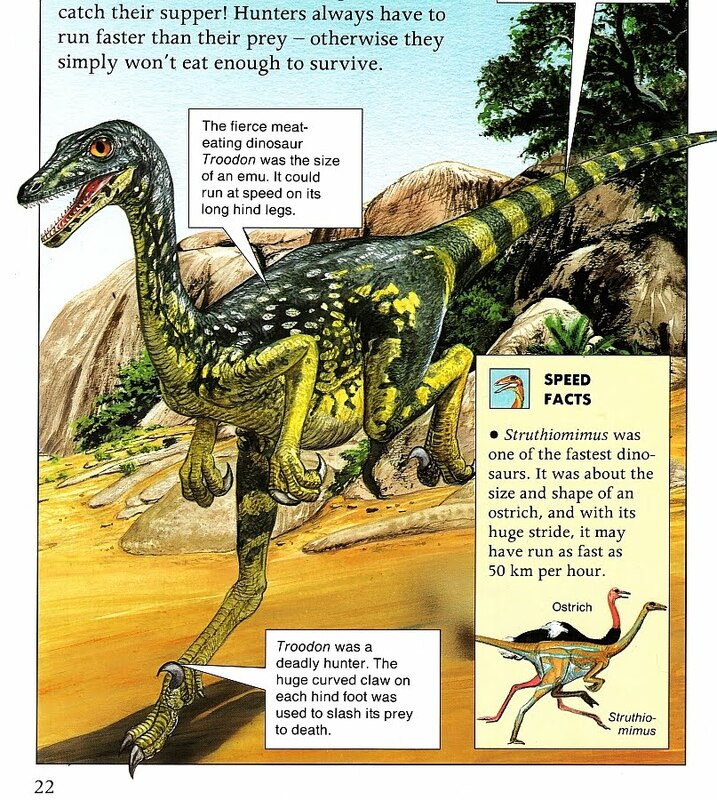 Perhaps, two decades from now, some young twerp on a holo-blog will be lambasting the ludicrous palaeoart from 2011. On the other hand, will we ever see such a paradigm shift in the depiction of, in particular, maniraptoran dinosaurs again? Also, it's been a giggle. Maybe, as I rapidly run out of ideas and money, I'll give it another whirl. Or perhaps we could look at terrible tyrannosaurs, diabolical diplodocids or plain offensive oviraptorosaurs? The possibilities for childish mockery are almost endless...I like the idea of examining palaeoart 'memes' too (even if it's been done). One last thing: Vintage Dinosaur Art will return tomorrow, with another from me next week (updated following David's comment).